‘Amir bin Tufail was the nephew of ‘Amir bin Malik, who had brought the Jama’at. He was a bitter enemy of Islam and hated the Muslims to the core. When Haraam RA delivered Nabi’s SAW message to him, he did not even care to read it and attacked Haraam RA with his spear, which pierced through the latter’s body. Haraam uttered “By the Lord of the Ka`bah, I am successful,” and died. The heartless person had no consideration for the guarantee given by his uncle, or for the accepted tradition all over the world, that nobody will kill the envoy (messenger). He then called the people of his clan and encouraged them to kill all the Sahabah camping at Bi’r Ma’oona. The people hesitated due to the guarantee given by ‘Amir bin Malik. He collected a large number of people from the neighbouring tribes and attacked the Muslims. They murdered each one of them except Ka’b bin Zaid RA , who had some life left in him and the enemy left him as dead. While grazing the camels, Munzir RA and Umar RA noticed vultures flying in the air. They exclaimed, “Something foul has happened,” and returned to the camp. They both went and jumped into the thick of battle. Munzir RA was killed and ‘Umar RA was captured. As ‘Amir’s mother had to set free a slave in connection with some vow that she had made, ‘Amir set ‘Umar RA free and let him go. 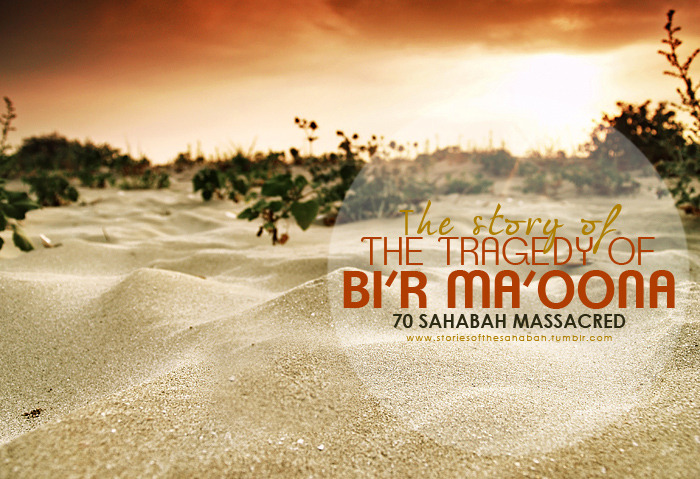 ‘Amir bin Fuhairah , a slave of Abu Bakr , was also among those who were killed at Bi’r Ma’oona. Jabbar bin Salmi, who killed him, says: “When I stabbed my spear through him, he said ‘By Allah, I have been successful and to my surprise I saw his body lifted upwards towards the sky. I made enquiries later on as to what was the success that ‘Amir bin Fuhairah meant when he uttered, ‘By Allah, I have been successful.’ I was told that it was that of entering into Jannat. This made me embrace Islam.” These are the outstanding people, of whom Islam is proud. Death had really more attraction for them than wine for their enemies. They felt most successful at the time of their death as they carried out deeds which were sure to win Allah’s pleasure. In 625 C.E., one of the chiefs of the tribe of Kilab, Abu Bara Aamir requested the Holy Prophet to send Muslim missionaries to propagate Islam among the tribe. The Holy Prophet sent seventy Muslim missionaries with the chief. The party halted at a place Bir Maunah, and sent a Muslim, Haram b Mathan, along with the letter of the Holy Prophet to Aamir b Tufail, the principal chief of the tribe of Kilab. Aamir b Tufail killed Haram, and marched with an army to Bir Maunah. He assassinated all the Muslim missionaries except one, Amr b. Umayyah by name. Aamir b Tufail released Amr b Umayyah according to his mother's vow to free a slave. On his way back to Madina, Amr b Umayyah killed two persons belonging to the tribe of Banu Amar considering them to be enemies. As a matter of fact, the Holy Prophet had given the tribe amnesty. When the case was brought to the notice of Holy Prophet, he agreed to pay indemnity to the tribe for its murdered persons.